System 800 K is based on the design principles of System 800 – the clear style and characteristically large radii were picked up for the System 800 K material variant. The system is made of high-quality polyamide. 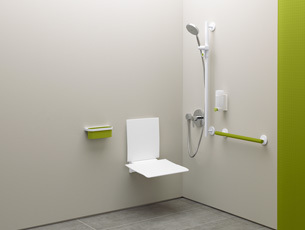 Brilliant white is the basic colour of sanitary System 800 K.
Functional elements can be designed in colour on request. The deliberate use of highly contrasting colours characterises the system made of polyamide – this facilitates orientation and makes intuitive use possible. 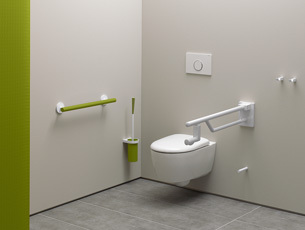 Due to the material, System 800 K is especially suitable for the care sector. The non-porous surface is easy to clean and is pleasant to touch. Colourful accents in System 800 K create a feel-good atmosphere. The highly contrasting design of the functional elements highlights them clearly and therefore makes them easy for people with impaired vision to discern too.